Fertile Mind are the Australian distributors of the Manduca soft structured carrier. The manduca is a versatile baby carrier that is suitable from newborn to a toddler up to 20kg- I was able to carry both my 1yo and 3yo very comfortably in the Manduca. It provides great support- keeping baby’s legs in the ideal M position and has a range of settings to fit most babies from newborn with the ingenious built in insert, to infants without the insert and panel zipped to a shorter body, to toddlers with the panel unzipped. Manduca also have a device available seperately called a “Size It” that cinches the seat in for the in between phases- even though my baby didn’t need it, if you are buying for a newborn, I’d recommend adding a “Size It” to your cart. One of the things I usually find uncomfortable with soft structured carriers is the webbing- Manduca’s padded straps are quite generous so I didn’t find much webbing digging into my fluffy bits on my side. I’m a ladies size 16 and found the Manduca very generous in it’s straps and it would definitely accomodate parents of larger sizes. 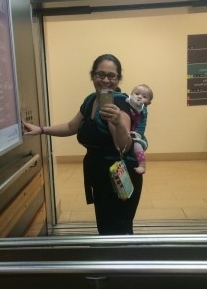 My favourite feature of the Manduca however is the ability to cross the straps when carrying my baby on the front. It is super easy, even my husband found himself reaching for the Manduca to cross the straps when he was out with Zoey without me. Crossing the straps for me, added to the length of time I could comfortably carry either of my daughters- usually if I just use the simple front carry, after 30-45 minutes my shoulders and back starts to ache, yet with straps crossed I can carry for 1-2 hours with no fatigue. The great thing about the Manduca is that it’s readily available in store as well as online. Check out Fertile Mind for the full range of colours and prints (my favourite is the petrol as pictured, but I really love the circadelic prints too) as well as a list of authorised stockists. Don’t forget to check out our Facebook page for a Giveaway. Our first wear of the Manduca- Zoey and I love it. Back carry is really comfortable in the Manduca- even around my tummy area, thanks to the waist band.